I came across this recipe by accident, and it was all down to have plums stolen off my tree last year. This year I decided that it wasn't going to happen - so as soon as the fruit was ripe I stripped the entire crop and brought it home. Two plum crumbles later - superb, I can now make them the way my grandmother used to - I needed a plan to clear the rest of the fruit. 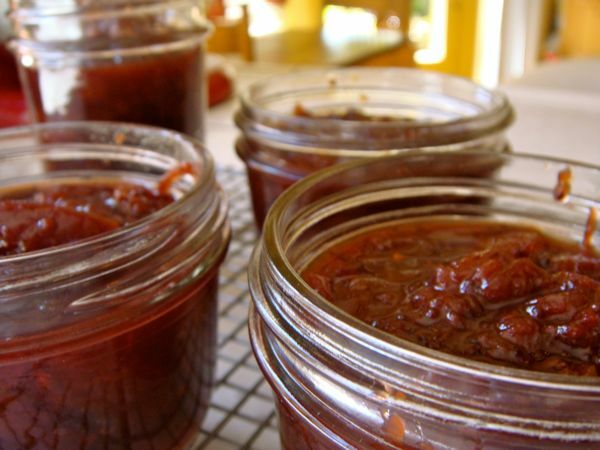 Luckily a good friend of mine had lent me a cookbook for its simnel cake recipe and in it I found this traditional, simple English recipe for plum chutney. It is gorgeous, but the only reason I have listed the recipe on this site is because I have had to give the book back. Now of course the recipe is easy to hand whenever I need it. I hope you like it - it is gorgeous! Mix together the plums, carrots and vinegar, bring to the boil and then simmer for about 10 minutes until the mix is tender. Stir in all the remaining ingredients and simmer for about 20 minutes until the mixture is thick. Stir well, then spoon into heat sterilised jars and leave to cool. Seal and label.